This Alert is designed to offer easy to understand and easy to implement year-end tax strategies in times of incredible tax uncertainty. This Alert is also designed to stimulate thought and inspire action during one of the most challenging year-end tax planning environments in recent history. Legislation affecting your ultimate federal tax bill has become a common and annual event. The most significant events impacting last year's (2011) tax returns were the complex changes made to the reporting requirements for capital gains and losses and the new disclosure rules regarding certain financial accounts, as well as the extensive reporting required for investments in publicly traded partnerships. None of these changes, however, directly affected the level of your tax obligations, although they likely affected the level of your tax preparation fee. This year, however, promises to be unlike any year ever. Not only are there expiring provisions, including the Bush tax cuts, but there are also provisions that already expired last year that may or may not be retroactively reinstated and more than 20 new taxes under the Patient Protection and Affordable Care Act (commonly called Obamacare), which may or may not be repealed in whole or in part. As a result of unprecedented levels of uncertainty, the complexity of tax law for 2012 has wreaked havoc and will continue to do so on year-end and beyond tax planning. With the reelection of President Obama, the U.S. House remaining in Republican control and the U.S. Senate remaining in Democratic control, it has become apparent that the clarity that was hoped for with respect to tax rates as well as additional healthcare reform legislation is unlikely to arrive anytime soon. The Bush-Era tax cuts sunset (which means expire), which will cause a substantial increase in tax rates effective January 1, 2013. Last year's temporary payroll tax cuts that provided a 2% tax decrease for workers will end. A number of tax breaks for businesses will end. The alternative minimum tax (AMT) rears its ugly head and is expected to increase tax for about 30 million taxpayers. Taxes increase as a result of President Obama's healthcare law. Given the continued and expected stalemate in Washington, it looks like we will have to wait, maybe until deep December 2012 or before the end of January 2013, to see what really will occur. Recognizing the timing, will you have enough time to implement your plan to cut your taxes? This is probably one of the most challenging years for planners and taxpayers to design and implement a tax minimization plan. The federal estate tax exemption sharply drops from $5.12 million to $1 million and the federal estate tax rate jumps from 35% to 55%. At this point in time, all are guessing at what the tax law may be and what possible effect it could have on your tax position for 2012 and 2013. *Additional tax on wages and self-employment income in addition to current Social Security and Medicare taxes. It is unlikely that any action, other than lots of chatter, will take place before Christmas unless President Obama and House Speaker John Boehner quickly unlock the political paralysis. It is likely that the payroll tax cut, which reduced an employee's and self-employed's share of Social Security taxes by 2%, will expire at year-end as scheduled. It is likely that many of the popular tax provisions that either expired in 2011 or are scheduled to expire at the end of 2012, as well as the previously extended temporary tax provisions—commonly referred to as "tax extenders"—that affect individuals, businesses, charitable giving, energy, community development and disaster relief will be extended. They include Alternative Minimum Tax relief, the above-the-line deduction for teachers' classroom expenses, the deduction for state and local general sales taxes, the deduction for qualified tuition and fees, tax-free distributions from IRAs to charities for people age 70-1/2 or older; the exclusion from gross income for discharge of indebtedness on a principal residence and the deduction for mortgage insurance premiums to name a few. It is likely that a short-term extension of the Bush tax cuts will occur, which would avoid/delay the additional tax bite. It would not be surprising if the threshold for the lower Bush-era tax rates is extended for family incomes up to $400,000 or $500,000 or $1 million instead of the current $200,000 for individuals and $250,000 for couples proposed by the president. It is likely that the IRS will not publish final tax forms and will not finalize computer programming until January or February 2013, with tax season officially beginning shortly thereafter. Unfortunately, the longer it takes to reach an agreement, the greater the likelihood of a compressed tax season for tax preparers and taxpayers and the greater the possibility of chaos between taxpayers, their tax preparers and the IRS. Incidentally, for the politicians, there may be a noble way to unlock the political paralysis so that President Obama and the Democrats achieve their objective of higher tax contributions from the wealthy and the Republicans maintain the Bush tax rates for all taxpayers, including the wealthy (however defined) so that both parties can claim victory. How, you may ask? Cap the level of tax deductions for upper-income individuals. Governor Romney proposed this strategy throughout his presidential campaign by setting a dollar amount of deductions, with taxpayers individually choosing how to use them in terms of mortgage deductions, state and local income taxes or charitable donations, to name a few. President Obama also proposed the "cap" on deductions concept early on in the budget discussions so both can take ownership of the solution. Don't let the tax tail wag the financial dog. That is, a proposed transaction should make economic sense in addition to saving taxes. For example, even if you are betting that capital gains rates will increase (and likely a good bet), if the expected after-tax appreciation in your stock or mutual fund in future years exceeds the increase in income tax that you would pay on such a sale, it may be more prudent to hold off selling. Don't forget that tax planning is a year-round activity. It is prudent to keep taxes in mind throughout the year, not just at year-end. This year-round approach will give you plenty of time to evaluate your situation and make necessary changes. Don't forget that any decision to save taxes by accelerating income needs to consider the possibility that this means paying taxes early and foregoing the use of money that could have been otherwise invested. Accordingly, the time value of money can make a bad decision worse or, hopefully, a good decision better. Consult your tax practitioner and look at your tax situation for at least two years at a time, with the objective of reducing your tax liability for both years combined, not just for 2012. Everyone's situation is unique. Consult your financial planner and stay focused on sound financial-planning principles. Consult your estate lawyer and review your current estate plan. Plan now, based on current law, and revise those plans quickly as the law and your needs change. We will be carefully monitoring year-end and early 2013 developments to assist our clients with quick-strike decisions or last-minute changes. With this in mind, and despite the uncertainty of tax rates for 2012, 2013 and beyond, below are select and easy-to-execute planning considerations for both individual and business taxpayers. If your 2013 tax bracket is expected to be lower (even with the anticipated higher rates), whether due to a change in employment or a rebalancing of your investment portfolio, it may be advisable to defer taxable income from 2012 into 2013. Cash-basis business taxpayers can defer taxable income by waiting until late in the year to issue bills, while individuals can defer income by delaying receipt of bonus payments until 2013. Taxable income can also be deferred by accelerating deductible business expenditures into this year. Deferring income may also be beneficial to taxpayers affected by unfavorable phase-out rules that reduce or eliminate various tax breaks, such as the child tax credit, education tax credits and the like. However, the time-honored strategy of deferring income may be somewhat dicey this year, because if the Bush tax cuts expire at the end of this year, this strategy may not be advisable, as deferring income from 2012 into 2013 could expose you to higher marginal tax rates in 2013, possibly as high as 43.4% for some taxpayers. If it is likely that you will be in a higher tax bracket next year irrespective or as a result of potential tax hikes, you should consider accelerating income into 2012 and deferring deductions until 2013. Accelerating income (as well as postponing certain deductions) may also be beneficial if you are subject to the AMT and AMT relief is not extended to 2012. Your tax savings could reach up to 7% per taxable dollar. For 2012, the federal income tax rate on long-term capital gains and qualified dividends is 0% for taxpayers falling within the 10% or 15% federal income tax rate brackets. This rate applies to taxpayers with taxable income not exceeding $70,700 for married filing joint taxpayers and $35,350 for single taxpayers. If your income is too high to benefit from the 0% rate, you may have children, grandchildren or other loved ones who fall within one of the lower two brackets. If so, consider gifting to them appreciated stock or mutual fund shares that they can then sell and pay 0% tax on the resulting long-term gains. Gains will be long term to the recipient as long as your ownership period plus the gift recipient's ownership period (before he or she sells) equals at least one year and a day. Gifting stocks that pay dividends is another option. As long as the dividends fall within the gift recipient's 10% or 15% rate bracket, they will be federal income-tax-free. If the Bush tax cuts expire at year-end, the minimum tax rate on 2013 long-term gains for these taxpayers will be 10%, while the minimum rate on 2013 dividends will be 15%. Consider the strategies above to take advantage of the 0% rate this year, as next year, it might be history. It is important to note that if you gift securities to someone under age 24, the "kiddie tax" rules could potentially cause some of the resulting capital gains and dividends to be taxed at the parents' higher tax rates instead of at the gift recipient's lower rates, which would defeat the purpose of the gift. Also, gifting assets valued at more than $13,000 at the time of the gift to an individual gift recipient will generally reduce your unified federal gift and estate tax exemption. However, you and your spouse can together give away up to $26,000 per recipient without reducing your exemptions. Absent action by Congress, the current 15% long-term capital gains rate will jump to 20%, effective January 1, 2013, while dividends will be taxed as ordinary income, also jumping from the current 15% rate to a maximum tax rate potentially as high as 39.6%. Additionally, high-income taxpayers (single taxpayers with adjusted gross income (AGI) of more than $200,000 and married taxpayers filing jointly with AGI above $250,000) will be subject to an additional 3.8% Medicare tax on unearned income after December 31, 2012. Now may be a good time to harvest gains into 2012 by cashing in some long-term winners to benefit from today's historically low capital gains tax rates but you may wish to consider what we noted above (e.g. : Don't let the tax tail wag the financial dog). A useful strategy may be to sell and immediately repurchase the same appreciated long-term gains securities that you would otherwise continue to hold and intend to sell over the next few years. The effect of this strategy will be to accelerate the payment of tax to realize the benefit of the current lower rate and to step up your tax basis to the current fair market value. Because the wash sale rules apply only to losses, sale and immediate reinvestment is allowed without penalty. In the current brokerage environment, the cost of commissions and other frictions associated with sales and repurchases are insignificant and, thus, make this an attractive strategy. A potential downside is that this strategy accelerates the payment of tax, but considering the time value of money and the current low interest rate environment, it would take several years of holding the security to benefit from deferring the tax hit. Additionally, if the stock appreciates and you need to sell it in the next 12 months, the additional appreciation would be subject to the higher short-term capital gains rates. If you do not wish to pursue a sell and repurchase strategy, it may be worthwhile to perform a quantitative breakeven analysis to determine how much additional appreciation would be required to offset any additional tax hit associated with selling the stock in 2013, when capital gains tax rates may increase by 33%. The following illustration demonstrates that in order to preserve the same level of after-tax gain (assuming a $100,000 pre-tax gain) when capital gains rates are scheduled to increase 33% (15% to 20%), the gain would have to increase 6.25% to realize the same after-tax proceeds, even less after consideration is given to the time value of money (which is less significant in the current interest-rate environment). In this example, any increase in the appreciation of the security beyond 6.25% would provide additional after-tax gain, even at the higher tax rate. So, if you believe that the position will increase in appreciation by more than 6.25%, it may be worthwhile to hold onto the position, even under a higher tax-rate environment. If you will be subject to the Medicare surtax at 3.8%, you will need to experience appreciation of 11.55% to realize the same relative level of after tax gain. As noted above, the analysis to determine whether to hold the security or sell and repurchase to achieve similar or increased levels of after-tax gain can be complex. Planning ahead with your investment and tax advisors may be prudent, as it may be necessary to act quickly in the event of any late-year tax legislation. Selling securities at a loss before year-end can also be a good strategy. The resulting capital losses will offset capital gains from other sales this year, including short-term gains from securities owned for one year or less that would otherwise be taxed at ordinary income tax rates. Paying a higher tax rate on short-term gains becomes insignificant if you have enough capital losses to shelter them. However, long-term losses will be more beneficial after 2012 when rates may be higher. If capital losses for this year exceed capital gains, you will have a net capital loss for 2012. You may wish to use that net capital loss to shelter up to $3,000 of this year's high-taxed ordinary income from salaries, bonuses and self-employment ($1,500 if you are married and file separately). Any excess net capital loss is carried forward to next year. Beginning after December 31, 2012, the Patient Protection and Affordable Care Act imposes a 3.8% surtax on passive income of individuals, trusts and estates. The amount subject to the tax, for individuals, is the lesser of net investment income or the excess of the taxpayers' modified adjusted gross income over $250,000 for taxpayers married filing jointly; $125,000 for married taxpayers filing separately; and $200,000 for all other individual taxpayers. Net investment income excludes self-employment income, active trade or business income, gain on the sale of partnership or s-corp interests, qualified plan distributions and income from certain trusts. This tax is in addition to any other potential tax-rate increases on capital gains, dividends and ordinary income. Certain strategies may be beneficial in reducing net investment income resulting in a lower 3.8% Medicare tax liability, including but not limited to, the timing of Roth IRA conversions and estate or trust distributions, as well as the use of charitable remainder trusts and installment sales. If your traditional IRA is (or was) loaded with equities and has yet to fully recover from the beating taken during the 2008–2009 stock market meltdown, the tax hit from converting your traditional IRA into a Roth IRA now will likely be less than it would have been at the market peak. This is because a Roth conversion is treated as a taxable liquidation of your traditional IRA, followed by a nondeductible contribution to the new Roth IRA. While even the reduced tax hit from converting may be unwelcome, it may be a small price to pay for future tax savings. After the conversion, all the income and gains that accumulate in your Roth IRA, and all withdrawals, will be totally free of any federal income taxes—assuming you meet the tax-free withdrawal rules. In contrast, future withdrawals from a traditional IRA could be hit with tax rates that are higher than today's rates. It is essential to analyze whether paying the tax on the conversion now makes sense. Converting a large account all at once could push you into a higher 2012 tax bracket, and many variables must be considered, including assumptions about future tax rates; how long the account will remain untouched; and the rate of return earned on the Roth IRA investments. The decision to convert should not be made lightly. Individuals with retirement accounts are required to take withdrawals based on the size of their account and their age, beginning with the year they reach age 70-1/2. Failure to do so may result in a penalty of 50% of the amount not withdrawn. If you turned age 70-1/2 in 2012, you can delay your 2012 required distribution to 2013 if you choose. Waiting until 2013 will result in two distributions in 2013—the amount required for 2012 plus the amount required for 2013. 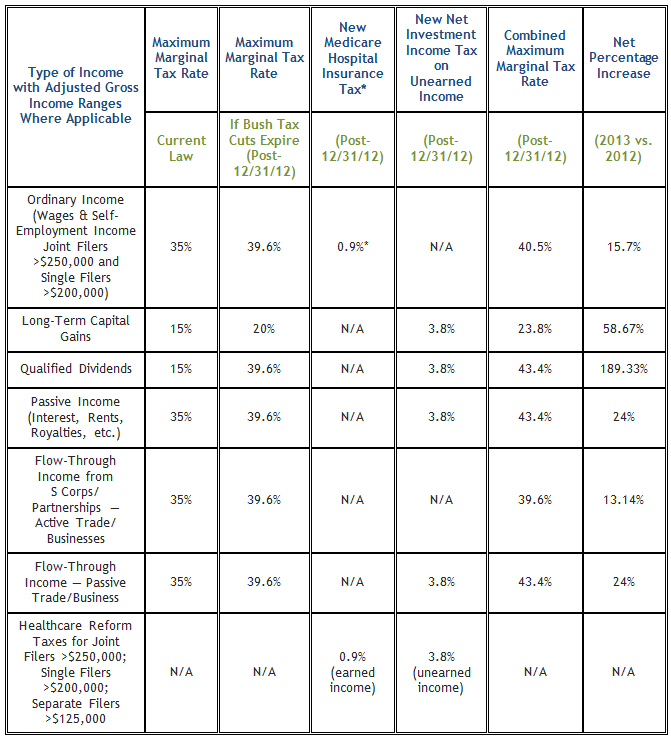 While deferring income is normally a sound tax strategy as discussed above, here it results in bunching income into 2013. Thus, bunching income into 2013 might put you into a higher tax bracket or might result in higher taxes as a result of the increased tax rates and bring you above the modified AGI level that will trigger the 3.8% Medicare contribution tax on net investment income. It may be prudent not to delay your 2012 required minimum distribution, especially if you are subject to the AMT (as a savings of up to 7% may be achieved). However, it could be beneficial to take both distributions in 2013 if you will be in a substantially lower bracket in 2013—for example, because you plan to retire late this year or early in 2013. While many recent tax-law changes may have reduced your regular federal income tax bill, it is likely those savings were negated by the AMT. Therefore, it is vital to evaluate all tax-planning strategies in light of the complex AMT rules before making any moves. For 2012, the unified federal gift and estate-tax exemption is a historically generous $5.12 million. However, the exemption will drop back to only $1 million in 2013 unless Congress takes action. In addition, the maximum federal estate-tax rate for 2013 and beyond is scheduled to rise from the current 35% to a painfully high 55%. Therefore, planning to avoid or minimize the federal estate tax remains a significant part of your overall financial plan. If you plan to leave your heirs more than $1 million, you may want to review your current estate plan and consult an estate-planning attorney. Additionally, you could lower your overall tax burden in a higher tax-rate environment through the use of generation-skipping trusts, intentionally defective grantor trusts, and charitable lead and remainder trusts. Work Opportunity Tax Credit (WOTC). Businesses planning to hire new employees should consider hiring qualifying veterans before year-end, to qualify for a work opportunity tax credit that ranges from $2,400 to $9,600. Under current law, the WOTC for qualifying veterans will not be available for post-2012 hires. Section 179 Deduction. Businesses may be able to take advantage of the temporarily increased Section 179 deduction. Under Section 179, an eligible business can often claim first-year depreciation deductions for the entire cost of new and used equipment, as well as software additions. For tax year 2012, the maximum Section 179 deduction is $139,000, while for tax years beginning in 2013, the maximum deduction is scheduled to drop down to only $25,000. Be mindful if your business is expected to have a tax loss or minimal profit for the year before considering any Section 179 deduction. A Section 179 deduction is not allowed if it will create or increase an overall business tax loss. 50% First-Year Bonus Depreciation. Businesses can also claim first-year bonus depreciation equal to 50% of the cost of most new (not used) equipment and software placed in service by December 31, 2012. For a new passenger auto or light truck used for business and subject to the luxury auto depreciation limitations, the 100% bonus depreciation break increases the maximum first-year depreciation deduction by $8,000 for vehicles placed in service during 2012. The 50% bonus depreciation break will expire at year-end, unless Congress extends it. 50% bonus depreciation deductions can create or increase a net operating loss (NOL) for the 2012 tax year. The NOL can then be carried back to 2012 and/or 2011 to collect a refund of taxes paid in one or both of those years. Consider Converting C Corporations to S Corporations or Limited Liability Companies (LLCs). Given the possible expiration of historically low tax rates, it may be worth considering converting a C corporation to an S Corporation or an LLC, since C corporations are subject to double taxation (at the corporate level and again at the shareholder level). Converting a C corporation to either an S corporation or an LLC eliminates double taxation, as profits are passed through the corporate level directly to the shareholders. It is important to note that when converting to an LLC this transaction requires liquidating the C corporation, which may result in taxation at both the corporate and shareholder levels. Similarly, compensation plans should be revisited in comparison to dividend payments. Additionally, you may wish to consider exercising stock options in 2012. Net Operating Losses (NOLs). If business losses are anticipated, plan to maximize their benefit through tax planning. NOLs may be carried back two years to secure a refund of previously paid tax. To the extent an NOL remains unused after the two-year carryback, it may be carried forward up to 20 years to offset future taxable income. If an NOL is generated and carried back, consider the acceleration of expenses to increase the loss to use the NOL to its maximum advantage. Conversely, consider deferring taxable income into the following year by delaying the issuance of invoices to clients and customers. Bad Debts. In the current economic climate, collecting receivables is often a lengthy, and sometimes unsuccessful, process. Remember that a deduction for bad debts is permitted for companies that use the accrual basis of accounting when the receivable is deemed to be totally or partially worthless. It may be prudent to maintain adequate records in support of failed collection attempts in the event the IRS challenges the deduction. Alternative Minimum Tax for Corporations. Similar to individuals, AMT can also be a burden to corporations. If applicable, AMT for corporations applies at a 20% rate, but is not applicable provided a gross-income test is met. To avoid the 20% rate, a corporation's average annual gross receipts for the three consecutive tax years preceding the current tax year must be equal to or less than $7.5 million. Again, proper tax planning can help reduce or eliminate AMT for your corporation. This Alert is intended to provide you with a few ideas that may be worth considering for the balance of 2012 and beyond. As potentially major legislative developments take place, we are available to discuss the impact of a new or pending tax law on your personal or business situation. For other tax and related topics, please visit our publications page located here or contact any of the practitioners in the Tax Accounting Group.